Groundscape Solutions, A Fort Worth Landscaping Company, designs and installs a concrete pathway leading to a pergola covered patio. This pathway is stained and stamped making the pathway pop from the lawn. Pathways or walkways make a great way to get from the house to the driveway or detached patio without having to tromp through the grass to get there. 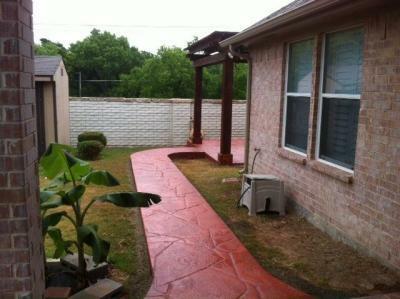 Give us a call at 817-759-0102 for a quote or visit our website at www.groundscape.com Groundscape Solutions is a fully insured landscaping company and will provide references.